DONATING BLOOD is as good as breathing life into some one. Blood donors deserve highest respect for their self sacrifice. There is a continuous increase in the global demand of blood but there is a severe mismatch between demand and supply. The developing countries are the ones suffering the most in this regard. These countries, home to about 82% of the world’s population receive just 38% of the total units of blood donated. India is no exception, where the demand stands at a colossal 8 million units and the demand falls short by 2.5 million units. The reason for this is attributed to the paucity of donors and improper usage of donated blood. Global statistics say that 3 lives can be saved for every unit of donated blood, but in India only 1 life is saved for the same amount of blood. There is hence a pressing need of more and more units of blood and ensuring their proper usage. Couple these facts with the immense satisfaction derived in saving a life and we had reasons enough to organize a blood donation camp! We did it in collaboration with IMA Dehradun and Himalayan Institute Hospital Dehradun and Government Hospital, Roorkee on 13th September. NSS was successful in removing general misconceptions about blood donation among students prior to the camp by the way of a motivational lecture. They were made aware of the various benefits of donating blood like refreshing of blood by production of new Red Blood Cells to replenish the blood lost, and the reduced danger of heart diseases. We received an overwhelming response from students with a total of 525 units of blood being collected during the course of the day. We had a much higher number of people willing but quite a few were sent back owing to some health problems! It was immensely gratifying to see such an excellent response and to realize that all our efforts in trying to make a difference in people’s lives weren’t futile! Director Dr. Saxena thanked NSS and all those who could spare a few minutes of their time for this kind gesture and helped in saving countless lives. 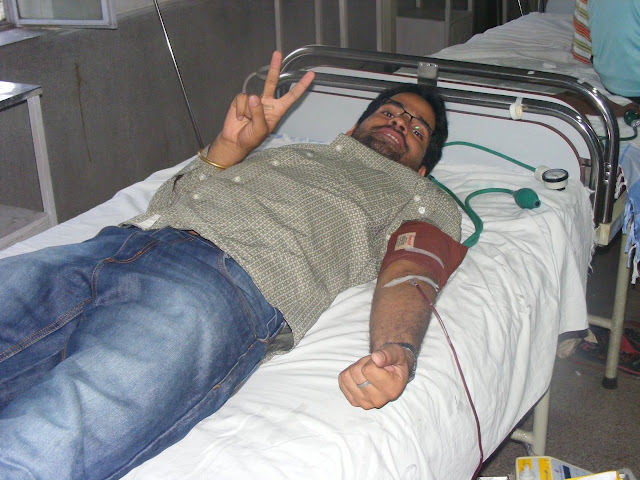 “Blood Donation is a supreme and noble service to the mankind. It gives great satisfaction and young people should donate blood occasionally”, he said. Dean of Students’ Welfare was also very appreciative of our efforts and commended NSS on its steady progress.NSS also distributed goodies and gifts to the donors as a token of appreciation for being a part of this noble purpose. I did organise many camps but I couldn't donate beacuse I was unwell..